Lynn Shelton’s new indie dramedy Touchy Feely is a film about soul searching, intimacy and healing that examines what happens when a family’s precarious balance is suddenly upset by an unexpected journey of self-exploration that no one saw coming. Written and directed by Shelton, the movie was shot on location in Seattle and boasts a strong ensemble cast that includes Rosemarie DeWitt, Josh Pais, Ellen Page, Allison Janney, Ron Livingston, Scoot McNairy and newcomer Tomo Nakayama. Now available on iTunes/On Demand, and in theaters September 6th, Touchy Feely was an official selection at the 2013 Sundance Film Festival. Question: What was it like reuniting with Rosemarie? She was phenomenal in Your Sister’s Sister. It was nice to see the two of you working together again and doing something different this time around. LYNN SHELTON: Yes, very different. It was a little bit of a tease because I said, “Will you work with me again” and she was like, “Yeah,” and she thought it would be very similar. Your Sister’s Sister was pretty fun, like madcap fun. There were a lot of laughs. And this was like, “Can you cry out of the right eye this time? The left eye’s not working. Could you go and do your super depressed now in this situation?” Oh my God, poor girl, what I did to her. I worked with her on Your Sister’s Sister. She came into that project three days before we started shooting and saved us because we had just lost another actor. It was an incredible experience working with her. She’s so intelligent. She’s so engaged. She’s such an amazing actor. This character that had been bouncing around the very back recesses of my mind for a few years all of a sudden bubbled up to the surface and it was like, “It’s Rose. It’s got to be Rose.” She became the muse for that character. I had this idea of a massage therapist who can’t touch bodies anymore which just seemed like, “How could you? You have such an intimate relationship with the bodies of these total strangers. It seems like you’d just reach a threshold at some point and go, ‘I can’t. Bodies are too freaky. Skin is too weird.’” She ended up being the creative catalyst for the making of the movie. And then, it was a different experience for sure just because tonally the whole movie is different and the character. She’s one of my faves. I just love working with her. The music and the score work so well together in terms of supporting of the story and capturing the right tone. Can you talk a little about how your composer contributed to the film? SHELTON: I have to say about the music that I love giving props to Vinny Smith, my composer, because I feel like he made the film finally work. There are so many different storylines and it changes tonally a lot. A friend of mine who had been through the process had seen a couple of the rough edits, and then he came to Sundance and saw the final, and I said, “What was it like to see it? How did it change since you last saw it?” He said, “Well, you tightened it up and cinched it here and there, but the big difference was that Vinny came in and just hugged the whole thing together with his music.” I thought that was such a great way of putting it because it does. It felt like a cohesive whole. If you analyze it, he’s actually done a lot. The audience is feeling it subconsciously, mostly on a subconscious level. There are themes that he introduces early on, like Rosemarie’s character, Abby, has her own theme, and then it gets reprised later but it’s transformed. There are all those beautiful things like that. He creates these thematic musical moments that then get reprised here and there in different ways and transformed. I’m in love with the score and happy that you mentioned it. What about the live performance by Tomo Nakayama? SHELTON: Oh my God, speaking of music! Tomo Nakayama is this local musician who’s also a friend of mine in Seattle. I had an experience where I saw him in an a capella performance and it was actually in the space that we shot in. It’s this old church that has beautiful acoustics called the Fremont Abbey. I saw him give this show-stopping a cappella performance of a Judy Garland song and it was cathartic. It was like the most transcendent experience I’ve had in a live music situation. Literally, at the time, I thought to myself, “That voice in this space has to go into one of my movies.” So, it’s extremely satisfying that I was able to get him involved, and he turned out to be such a wonderful actor. I wrote this part that he wouldn’t have to do too much crazy acting and it’s based on him, but still, to be that comfortable and that at ease. I mean, he holds his own with Ellen Page. It’s amazing. And then, the payoff of finally getting to see him sing at the end, and the way that it ties together some of the plot lines as well, is very [satisfying]. Thanks for bringing him up. He’s an amazing talent. It was fun. I loved seeing Rosemarie and Ron on screen. Did you always know that Ron was going to come in and do that role or was that something that just evolved? I made up this whole idea of who he was and what he was like, and I could not figure out an actor to play him. And then, I met Ron (Livingston) at Sundance for the very first time when Your Sister’s Sister was there. Rosemarie brought him and we hung out at a condo party. The next morning I woke up and I was like, “Oh! That’s Adrian. Ron Livingston is Adrian. I can’t believe it!” It looked like he wasn’t going to say yes at first because he balked at the idea. He doesn’t like when couples are in movies together. He was like, “Yeah, I don’t know.” But then, he read the script and he talked to me, and he was like, “I would not normally say yes to this, but I actually think that this might be good. Our relationship could really help and it could be good.” I was like, “Please!” I love him in it. It’s so quick that you hardly see him. Do you remember the first performance you saw from Rosemarie that made an impression on you? SHELTON: I can’t remember which one was first. It was probably Rachel Getting Married and then seeing her in Mad Men. It was one or the other. I remember seeing one, and then the other one was like, “Who is that? She looks familiar.” And then, I figured out who it was. It was just those two roles. I don’t think I saw her in anything else. I didn’t see Matchstick Men. There’s just something about her that’s so real. I mean, I just completely believe her. I thought Rachel Getting Married was improvised because it felt so real to me. When I found out it was completely scripted, I was like, “Wow.” She’d never done improvisation before Your Sister’s Sister, but I had this faith that she’d be able to do it. Her performances seemed improvised, so thus, it seemed like she should be able to do it. Those two roles were not huge roles, but they just made a big impact on me. How were you able to get all these wonderful performances from the actors? SHELTON: It’s all about trust and emotional safety, and I find that it’s not just for the cast. It’s also for the crew. I’ve only worked this way and I don’t want to do an experiment where I work in other ways, so I have no idea if it’s true or not, but I have this theory. It feels to me like everyone is going to do their best work when they feel emotionally safe. Making art, being creative, is risky, especially for actors, but everybody on the set is being creative. You’re putting yourself out there with ideas, and to have your brain be free of stress so that it can actually do its best work, it feels like you want to have a real sense of intimacy and connection and trust with everybody. So, I try to build relationships with the actors, at least to some degree beforehand, whether it’s phone calls because I’m from Seattle or all of us meeting in person at some point, which is ideal if at all possible before we get on set together. I said we were going to have a weekend workshop when I came down to L.A. a few weeks before we shot, but I just made dinner for everybody and we hung out. That was the main thing. We talked a little bit about characters and ideas and maybe some production design and costume design ideas, but it was much more about just getting to know each other and trusting each other so that you can take that level of comfort onto the set. You’ve been directing for television lately. Is that a recent transition for you? SHELTON: My first job was Mad Men which was crazy. I’d always wanted to work in television once I found out — I think it was on Homicide — that they started to hire independent filmmakers to direct. There’s so much great TV and I always thought it would be such a fun little sideway to make money and then not have to worry about my films making a lot of money. If I don’t have to think about the commercial aspect of it, then I feel like I’m going to make better films. And so, I liked that idea. And then, I was lucky enough to get that job in Season 4, and then New Girl the next year, and then Ben and Kate, and then I directed a pilot in the spring amazingly. I feel blessed that I’ve been able to make a few inroads into that world because I enjoy it. If I wait for my own projects, I don’t get on set more than every 14 months which has been the shortest period of time. It’s just not enough time on set. That’s my favorite time. I live for that time on set. I feel like that’s when I’m stretching and flexing my muscles and learning how to direct better. It’s actually by having more time on set. It gives me more time with actors, and they always set up and give me these challenges I would have never given myself. It’s like I have to do a stunt where somebody whacks somebody else over the head with a cane and make it look like it really happened and stuff like that. I would never write that. There’s all kinds of fun toys to play with so I’ve felt lucky that way. Was that your voice in Prince Avalanche? How did you get involved in that? SHELTON: I got to act with Paul Rudd on the phone. I actually had a meeting with David Gordon Green, Jody Hill and Danny McBride because they have a company together called Rough House Pictures. I met with them because they were like, “We want to do these kinds of films. We want some female directors and female-driven stuff.” We’ve never actually been able to collaborate but I think maybe that was it, and we also have mutual friends like Todd Rohal who works with them a lot and they’re good buddies. We’d had conversations. We’d run into each other. He had just called me about an actor. I would email him and ask him things because directors like to trade notes a little bit about how’s this person to work with or how do you get the best performance out of this actor. 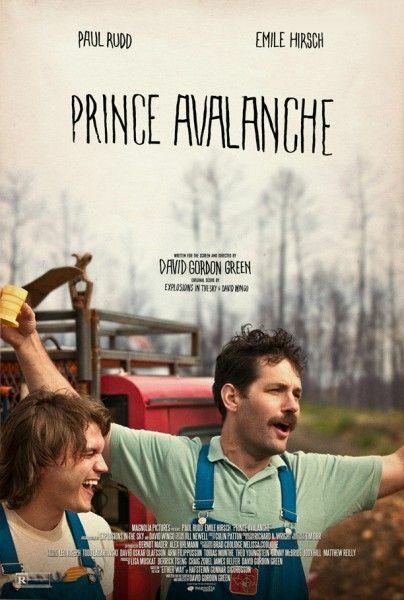 But also, he had just called me because he was about to do Prince Avalanche, and it was a much lower budget movie than he’d been doing, and he had questions about the union and whatever. So we had had a little confab, and then he was trying to think of who to play Danielle. This is what I had heard, and he told me a couple of weeks later. He told people, “I just had a conversation with Lynn. She has a nice voice.” He knew I had acted, so he just called me and randomly asked if I would do the scene. It was so funny. He sent me a script and then he had me improvise when we did the actual scene. I just had a mic on my side and I was talking to Paul on the phone. It was so weird and it was fun, but it was also super dramatic. After we were done, I thought, “Well, that was fun, but it will never end up in the movie.” It just didn’t seem [like it would], and then, the way that he put it in the film was so cool. It was one of my favorite parts of the film, and I loved that film, too. It was neat the way it was all abstracted. I liked that. SHELTON: I just finished shooting a film. Right now it’s called Laggies. I’m not sure it’s going to continue being called that or not. It’s a film starring Keira Knightley, Sam Rockwell, Chloe Moretz, and it was my first multi-million dollar film. It was a project where the script had actually originated with somebody else, with another writer, so that’s new for me as well. I was able to shoot it in Seattle, and we’re in the middle of editing it, so it should come out and premiere sometime in 2014. Will you be crossing over into television more in the future? SHELTON: I hope to keep working with television. I wouldn’t mind doing more. I’m actually attached to a pilot written by the same writer (Andrea Seigel) who wrote Laggies so that’s going to happen for HBO hopefully. She’s writing the script for them now. Hopefully, that will go into production, and then, I’ll keep doing little episodes here and there. Does your pilot have a title yet? SHELTON: I think it’s called… (laughs) I don’t know if I’m supposed to talk about it.